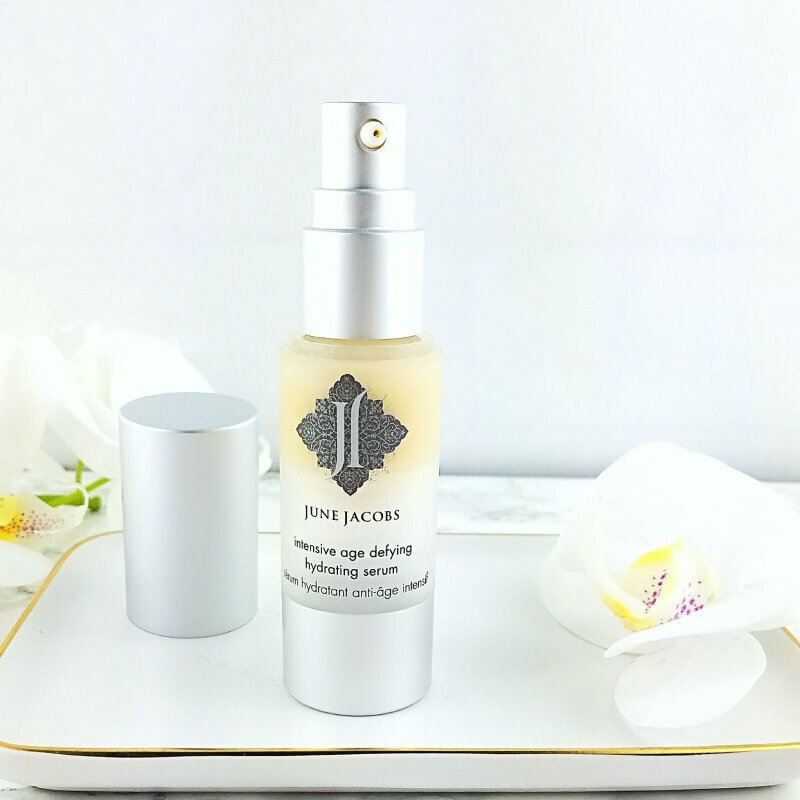 June Jacobs Intensive Age Defying Hydrating Serum has become an indispensable part of my skin care routine for one very simple and clear reason: It works! 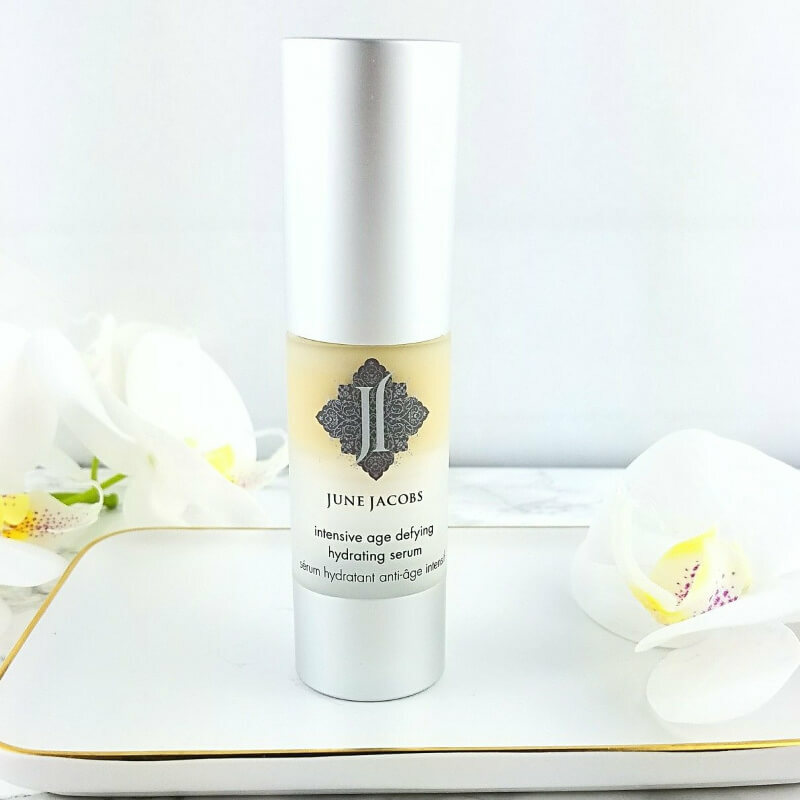 June Jacobs Intensive Age Defying Hydrating Serum is a silky, feather light liquid that has a very light, natural rose scent that dissipates upon application. 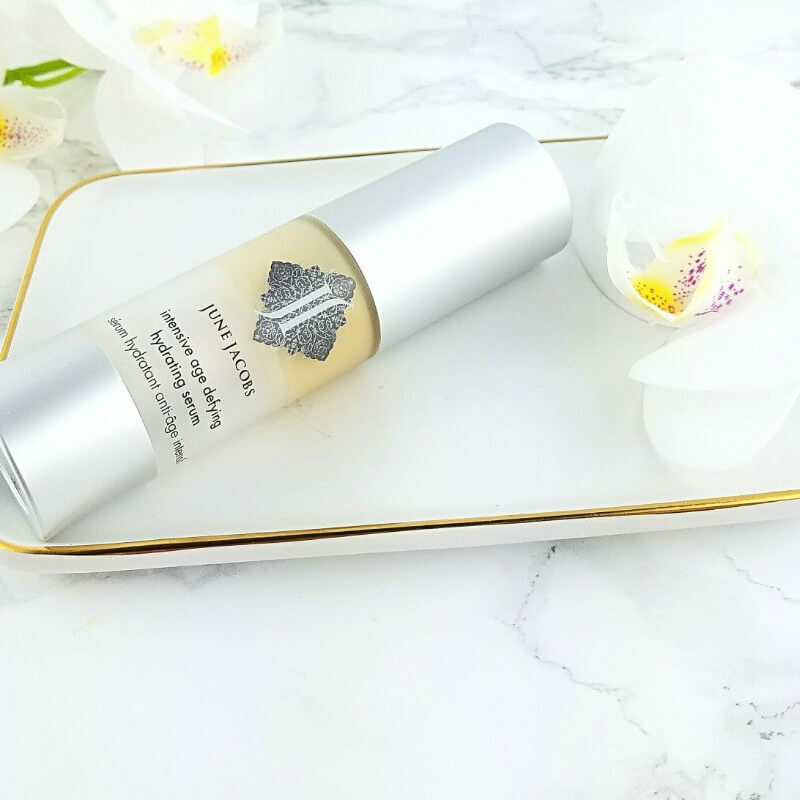 As I pat this serum on, it drops into my skin and instantly goes to work, hydrating and nourishing my complexion, leaving it feeling velvety soft, smooth and comfortable. As lovely as that feels, it is after I apply face cream that the real magic happens. I don't know how it does it but this serum amps up any moisturizer or eye cream I use, instantly transforming it into an hydrating powerhouse. Even moisturizers that I formerly found a bit too light for my very dry skin suddenly work for me. It's just the craziest, most amazing thing! The result of using this serum consistently is that my skin is overall more deeply hydrated and it feels softer and firmer, especially along the tops of my cheekbones and my jawline and it looks plumped up; my fine lines and wrinkles appear smoother and diminished and my complexion has a lovely, natural glow. I have yet to combine use of the June Jacobs serum with any other skin care product in my arsenal and have them not get on together. Whether I use a lightweight lotion or cream, my normal rich, ultra hydrating moisturizers or go with a facial oil or combo, it just works, every time. If you don't have dry skin, this serum should work just as wonderfully for you, too. I think that it would make a beautiful moisturizer for oily, combo or normal skin either alone or with your favorite lightweight cream or lotion. I am not someone who uses words and phrases like holy grail or must have lightly. I can happily use them for this lovely stuff. I also don't tend to keep many backup products around. I have backup bottles of a couple of very special nail polishes, one of a favorite cleansing balm that I love and of course, this serum, as it is a product that I don't ever want to be caught without. After using this serum I would love to try all of the June Jacobs Intensive Age Defying skin care products. 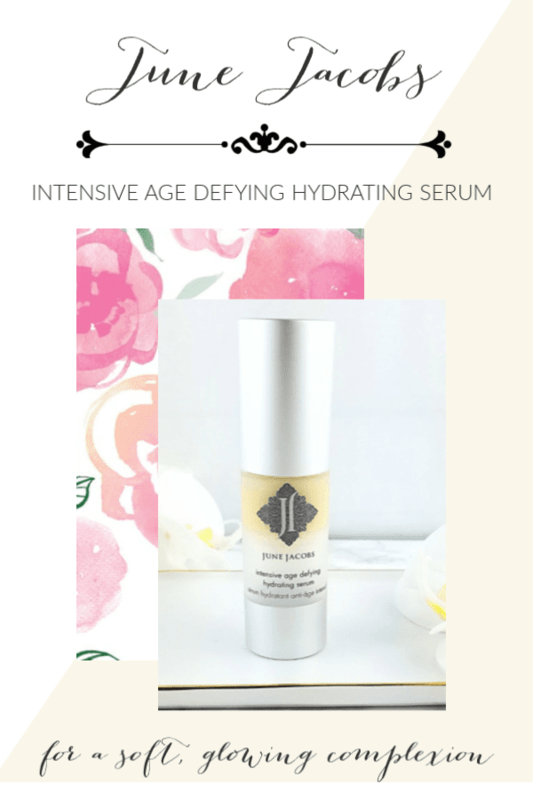 The June Jacobs Intensive Age Defying Hydrating Serum is a little spendy at $140.00 a bottle but in my opinion, it is worth every penny. If you sign up for the June Jacobs newsletter, you can save 15% on a future purchase and they do run specials. There is also EBATES to help defray the cost even more. If you are not familiar with EBATES or have never used them, simply put EBATES is an effortless online rebate program that costs you nothing to join or use and with the click of a button, pays you back cash for shopping. How easy and fantastic is that? I mean, if you're going to shop online, anyway why not get paid for it? If you found this helpful, won't you please share the Pinterest love? Just click the floating red Pinterest button to your left and find the long pic with the text for this product and pin it. Thank you, so much! June Jacobs brand sounds very familiar to me but I'm not sure how. The rose scent sounds divine, and I'm sure I'd love it. Gotta save my pennies for it Erika, I have gone through 6 captcha screens of verifying vehicles. I think it might be a little too much for many folks! If you do try it, I think that you'll love it. It's an amazing serum. Wait, what? Captcha? I don't have my comments set for Captcha. I HATE Captcha and I'd never deliberately subject anyone to it. *sigh Time to get into it. Grrr! I'm for sure damn tired of winter! I don't mind spending more on skincare when it WORKS.